Above: Dr. John Lanting receives the 2018 IVMA Veterinarian of the Year award. Presented by Dr. J.V. Bollar, the 2017 IVMA Veterinarian of the Year. Dr. John Lanting was named the 2018 IVMA Veterinarian of the Year. The ceremony took place during the IVMA Summer Meeting on June 15, 2018 at the Lewis-Clark State College in Lewiston, ID. Dr. Lanting has practiced veterinary medicine in the Magic Valley area for the past 47 years, primarily as a beef cattle practitioner. Up until just a few years ago, he also practiced some small animal medicine out of a clinic at his home. John’s mom liked to tell a fond memory of him doing surgeries in her kitchen shortly after he had graduated! Having been born, raised and living on the family-operated cattle ranch, he was a natural ambassador for the cattle industry. He is a well-respected and trusted member of the community and can often be heard giving sincere advice whenever asked. He has mentored many veterinary students and graduates. John is a proud family man who has raised two sons who started riding along on vet calls with him since before they could walk, and have learned more from him than many could ever realize. Carolyn, Todd and Chase were built-in veterinary technicians by default! John and his wife Carolyn have been married 39 years and are now often seen with their grandchildren in tow following around on the farm and learning the cattle (and veterinary!) business. Dr. John Lanting graduated from Washington State University College of Veterinary Medicine in 1971. He is actively involved in his community, as a 4-H volunteer and Hollister Presbyterian Church member. 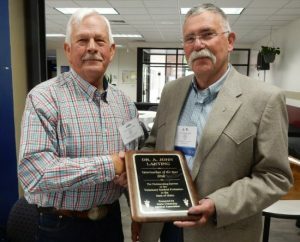 He has been a member of many organizations and served on the board of directors for several including the IVMA, AVMA, Idaho Board of Veterinary Medicine, CSI Vet Tech Advisory Board, State Trich Task Force, National Cattlemen’s Beef Association, Idaho Cattle Association, and the Magic Valley Cattle Association.